Ramazani, M., Farahmandjou, M., Firoozabadi, T. (2015). Effect of Nitric acid on Particle Morphology of the Nano-TiO2. International Journal of Nanoscience and Nanotechnology, 11(2), 115-122. M. Ramazani; M. Farahmandjou; T.P. Firoozabadi. "Effect of Nitric acid on Particle Morphology of the Nano-TiO2". International Journal of Nanoscience and Nanotechnology, 11, 2, 2015, 115-122. Ramazani, M., Farahmandjou, M., Firoozabadi, T. (2015). 'Effect of Nitric acid on Particle Morphology of the Nano-TiO2', International Journal of Nanoscience and Nanotechnology, 11(2), pp. 115-122. Ramazani, M., Farahmandjou, M., Firoozabadi, T. Effect of Nitric acid on Particle Morphology of the Nano-TiO2. 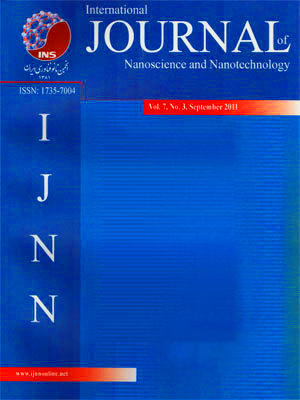 International Journal of Nanoscience and Nanotechnology, 2015; 11(2): 115-122. Nano-sized titanium dioxide TiO2 powder was prepared by new wet chemical route from its precursor Titanium (IV) chloride (TiCl4) as precursor with isopropoxy alcohol in presence of nitric acid under ambient condition. Their morphologies, phase compositions and components of the TiO2 nanoparticles were characterized by transmission electron microscopy (TEM), field emission scanning electron microscopy (FE-SEM), X-ray diffraction (XRD), electron dispersive spectroscopy (EDS), Fourier transform infrared spectroscopy (FTIR) and UV-Vis spectrophotometer. The TEM results showed the as-synthesized TiO2 formed in nanometer scale. The FE-SEM images showed that the size of TiO2 nanoparicles decreased with increasing annealing temperature while the uniformity of size distribution decreased. The FE-SEM images also revealed that the size of annealed TiO2 nanocrystals increased with increasing the value of nitric acid. The average grain size of anatase nanoparticles was obtained about 25nm. The crystal structure of the nanoparticles before and after annealing was analyzed by XRD analysis. When the calcinations increased above 550oC, the phase transformation of anatase to rutile occurred, but the anatase phase was still dominant. The sharp peaks in FTIR spectrum determined the purity of TiO2 nanoparticles and absorbance peak of UV-Vis spectrum showed anatase phase at wavelength about 380 nm with band gap of 3.26 ev for as-prepared TiO2 and rutile phase at wavelength about 382 nm with band gap of 3.24 ev for annealed TiO2 nanoparticles. The EDS spectrum showed peaks of titanium and oxygen.